Use less energy to help the planet and be kind to your wallet. Homeowners are always looking for ways to save money. You may have noticed that your energy bill seems to be ever increasing with the constant additions of devices in your household and the hike in gas prices. While the energy bill is dreaded every month, it is a utility that we often take for granted. Only when we’re stumbling around in the dark trying to find a torch when the power goes down do we realize the brilliance of electricity! With that said, you don’t have to live in the dark to save money on your electricity bill. 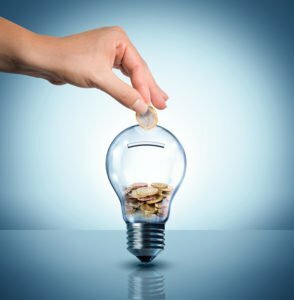 Here are the top ways to save energy around your home, save money, and benefit the environment by doing so. That’s what we call a win-win situation. Insulate the walls & windows. Fill your walls with insulation, stuff the attic with fiberglass insulation, and double-pane the windows. This significantly reduces the loss of hot and cold air that your thermostat works so hard at maintaining. In the winter and summer, you’ll get to enjoy turning the heating up less and the air con on lower, respectively. Wash your clothes on a cold cycle. Filling your washing machine up with hot water comes at a hefty price, more so than you may think. Skip warming up the water and put your clothes on a cold spin to use less energy! Dryers use a lot of energy thanks to its heating element. Save money and energy by putting up some clotheslines and hanging up wet clothes to dry! Instead of a bath, take a shower. Instead of a 20-minute shower, take a 5-minute one. You’ll find that you’ll have more time on your hands and your energy bills will significantly decrease. Make a habit of unplugging all the devices that you aren’t using. These ‘energy vampires’ are notorious for sucking up energy, even if they’re off but still plugged in. This is throwing money away – so unplug them! No, you don’t need to call them on the phone these days really. Most utilities provide you an online account that you can access to see how much you consume and when. If you know it, you can manage it. Not only will you benefit your pocket, but using less energy also helps the environment. While you focus on bettering your carbon footprint, leave homeowners insurance to the professionals. Contact McCarty Insurance Agency to get started on the right policy for your home and needs in Fresno and areas of California.